IELTS Unlimited Review Gift Certificate | JROOZ Review Center - Gateway to Canada | Canada Immigration Consultancy! Here's an early Christmas Gift from JROOZ Review Center! Canadian Immigration Consultancy - Gateway to Canada have been referring clients to JROOZ Review Center for almost a year now. Feedback from our clients were very positive and thus, we're formally endorsing JROOZ Review Center. Print this coupon and get P500 discount! 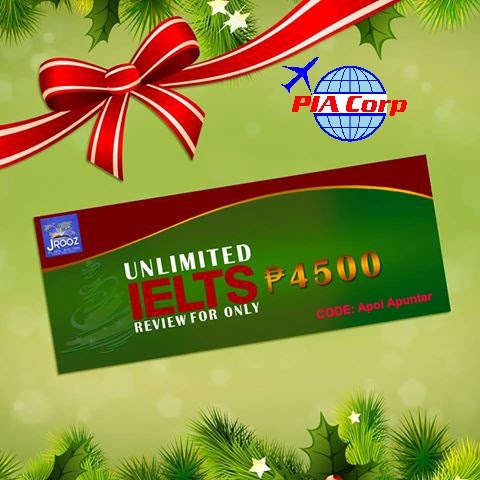 JROOZ offers IELTS Unlimited Review for P5,000. But if you present this coupon, you will be entitled to P500 discount!